But what if Force Z had adequate air-cover? The HMS Indomitable, one of the new 1937 programme carriers was assigned to Adm. Phillips. However she ran aground during trails in the Caribbean and needed several weeks repair in the US and missed her station. With so much variation it would be impossible to tell what would have happened had the HMS Indomitable sailed. This was only 3 days after Pearl Harbour and Japan had yet to declare war on Great Britain and Force Z was in situ largely as a political answer to an as yet unknown military question. For the purpose of this game I decided to follow events largely as they occurred. Adam. Phillips had failed to locate the landing fleet and was returning to Singapore. I-58 had found the task force and radioed in the strength and position. Japanese bombers were sent aloft to locate and sink Force Z. The only difference was the presence of the HMS Indomitable and 1 extra destroyer (others would have escorted the carrier but like the HMS Tenedos were on assumed to be on dispatch). The fleet was placed in the centre of the board on a SE bearing. 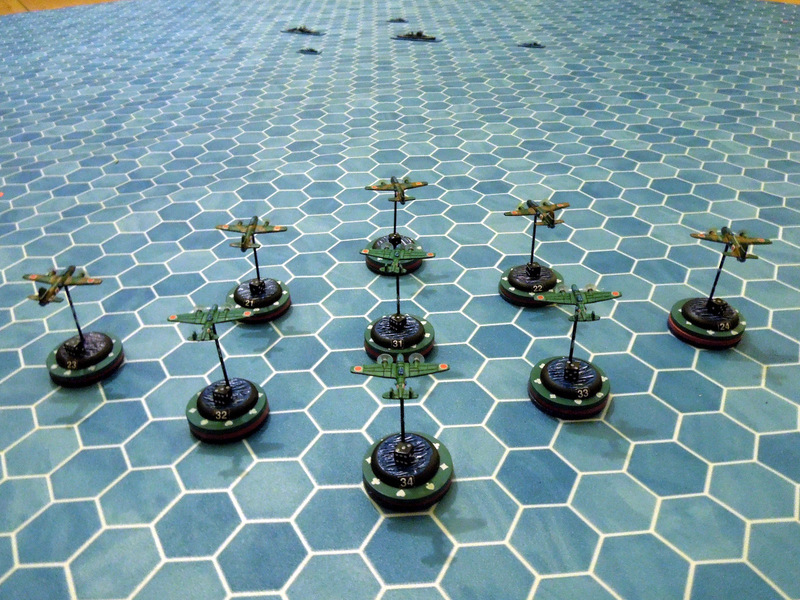 The three capital ships line astern eight hexes apart (Each model sits on a 3” x 1/2” base occupying 3 hexes). The destroyers are 7 hexes distant, one ahead and two in either side. Both the Prince of Wales and Repulse have 1x Heavy AA, 1x Medium AA and 2x Light AA. The Indomitable has 1x Medium AA and 2x Light AA. Note that due to the placement of the capital ships Light AA the same aircraft cannot be targeted by both batteries. Heavy AA can only fire in each Even numbered round. For playability I used a ratio of 1 aircraft model to 2 actual aircraft. Game One: Bombers at 12 o’clock! Medium-Bottom, cloud covers entire area TAL-6, no time limit. Objective: Bomb the HMS Indomitable. 2x Fairey Fulmar II, Green Crew. After placing the aircraft roll randomly for the initial direction. The bombers entered nearly due-south of their target. Flak form the Prince of Wales and the Repulse managed to break up their formation early on. The CAP however was slow to engage as their deployment had them initially travelling way from the bombers. Nonetheless the Fulmars we’re able to assist with the downing of one bomber before it released it’s payload. Both fighters were lost to defensive guns. 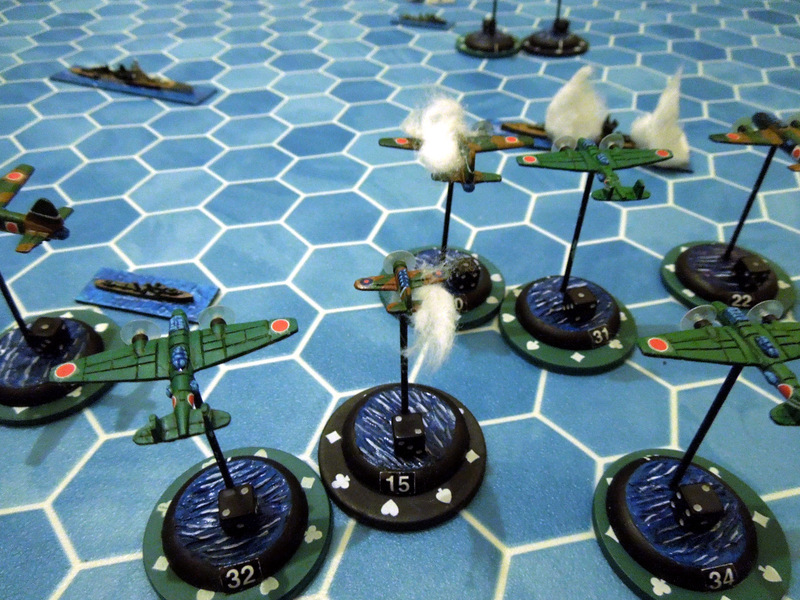 The Japanese bombardiers were on top form and scored 3 hits resulting in heavy losses to Indomitable’s air power: 3x Fulmars, 2x Hurricanes & 6x Albacores destroyed. 9x G4M1 ‘Betty’ Bombers. Torpedoes. Skilled Crew. Objective: Sink at least one capital ship, preferably the Indomitable. This second wave came 30 minutes after the first. Both the Repulse and the Prince of Wales require 5 torpedo hits to sink, the Indomitable 4 torpedo hits. In addition each will lose it’s primary AA after two and all but light AA after 3 hits. 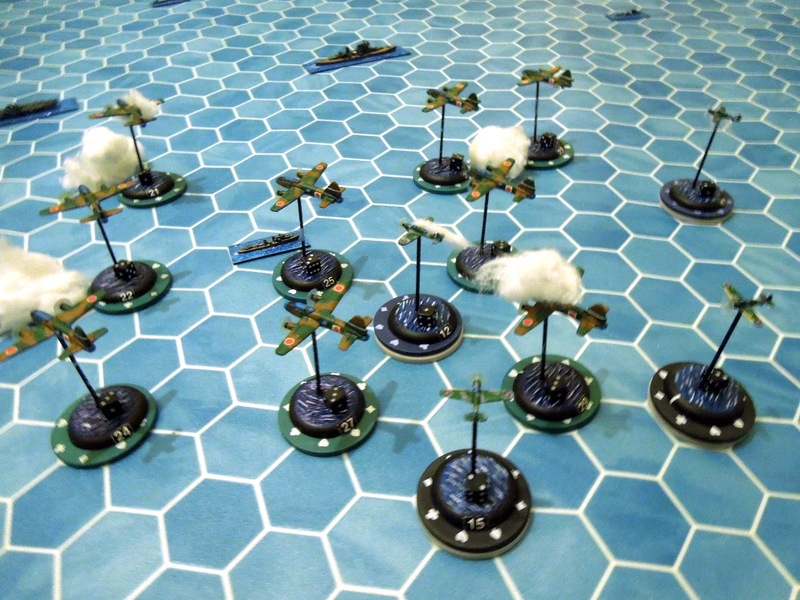 The Indomitable managed to get just 1 Fulmar and 3 Sea Hurricanes into the air for this game. All nine bombers entered from the SW corner in an open formation to limit the effects of flak. The CAP, operating in pairs, swept in on each flank of the bombers and chewing at the trailing aircraft. 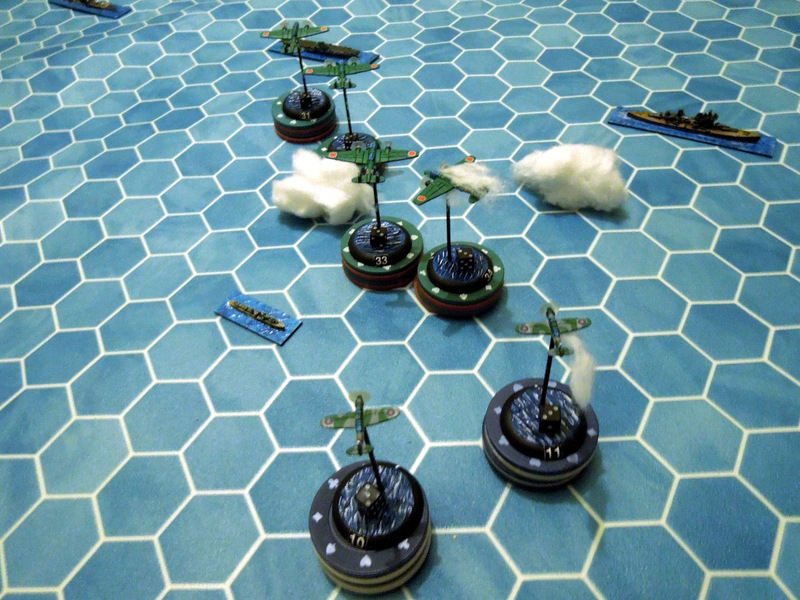 AA from the destroyers and capital ships focused their attention on the spearhead group. As the Betty’s dropped down to attack altitude a few were damaged by the AA, others were shook off course, choosing last minute passes at the battleship. The Indomitable took 3 torpedoes from six attacks, but as one scored a double 6 the resulting total of 4 hits was enough and the order was given to abandon ship. Two attacks on the Prince of Wales failed to connect. The air battle was fierce, only two (one of which was damaged) bombers survived the attack. All of the navy planes were lost, one due to miss-directed AA fire! 14x G4M1 ‘Betty’ Bombers. Torpedoes. Skilled Crew. Objective: Sink both capital ships. Place First. All aircraft within 5 hexes of any capital ship, any facing, TAL-5, any speed. The third wave came 30 minutes after the second. I decided that both capital ships would have ordered two destroyers to pick-up the survivors while they steamed ahead. 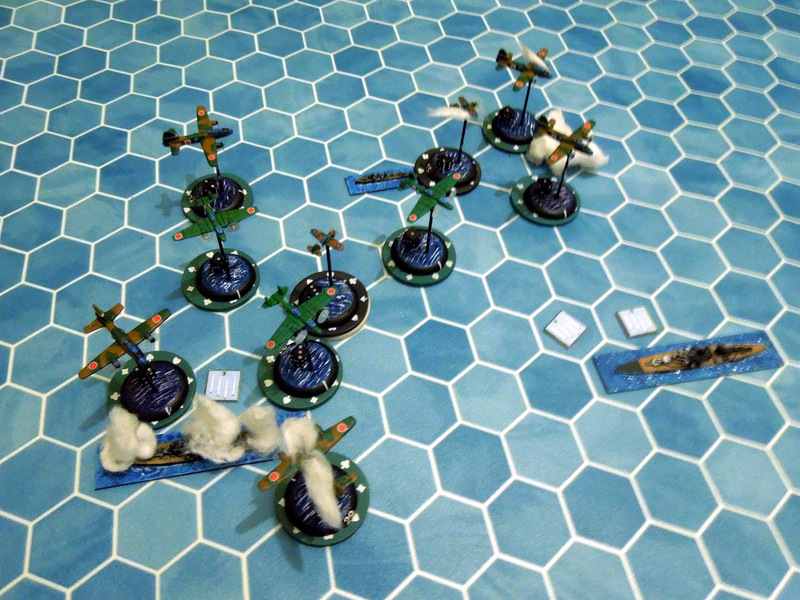 Both the Repulse and the Prince of Wales and one DD are line astern 5 hexes apart, one DD is stationed 5 hexes on either side. Damage rules as above. Given that the airbase was one hour from the battle, had Adm. Philips radioed for help at the first instance the RAAF would have arrived just in-time for the third attack. 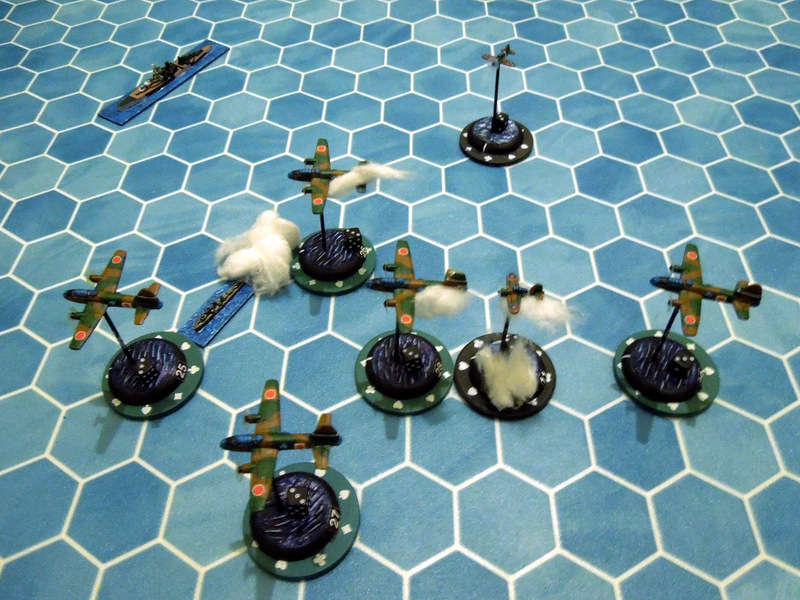 The RAAF broke into two groups of 3 & 2 planes to tackle the uneven groups of inbound bombers. 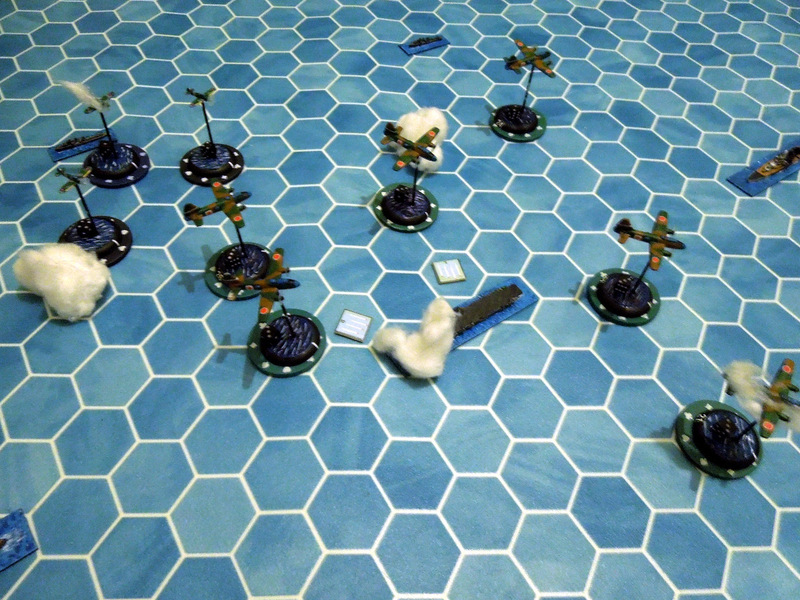 Of the smaller group of fighters #12 scored 4 kills before running short on ammo. Unfortunately his Buffalo was badly shot up as he pulled up out of the furball and lost control. On the opposite side the buffaloes got in amongst the Betty’s (The Nells in pic are proxies) doing what damage they could. But the cross-fire patterns of multiple bombers takes their toll. 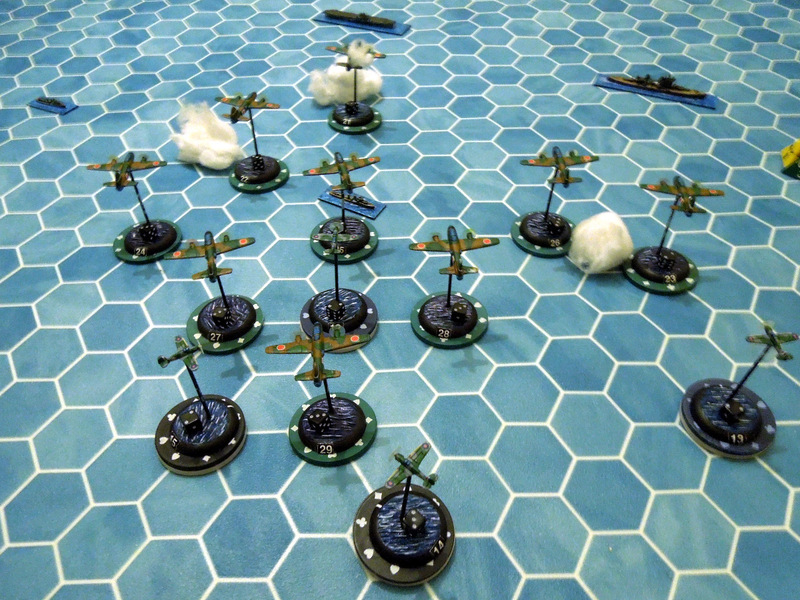 Almost simultaneously both groups pass through each other dropping torpedoes and dodging flak. The majority of the Japanese attacks are on the Prince of Wales, suffering 3 hits (two of which are critical) send the battleship to the bottom. The Repulse luckily avoiding both attacks. Six of the bombers make it home, none of the RAAF are so lucky. Objective: Bomb the HMS Repulse. HMS Repulse, 1x Heavy AA, fires on Even numbered rounds. Outcome. The bombers pass overhead failing to score any hits. Likewise the Repulses AA fails to score any hits. The early success of the high-level bombing severely limited the RN’s ability to fight off the subsequent waves of attacks. With greater air-cover the navy may have been able to down a few extra bombers before their attack runs thus saving the Indomitable and maintaining air superiority. The Japanese however lost significant numbers, both the Genzan and Kanoya bomber groups would be out of commission for several weeks. Although these will be missed during the land offensive, it would be considered a fair price for one carrier and one battleship. The HMS Repulse would likely have seen action at Java Sea the following February and may have tipped the balance in favour of the allies! Without Java the war in the Pacific would of had gone very differently for the Japanese.